The Dillard House is located in Dillard, Georgia, in the northeastern corner of the state. If you had a good pitching arm, you could throw a rock into North Carolina – literally. 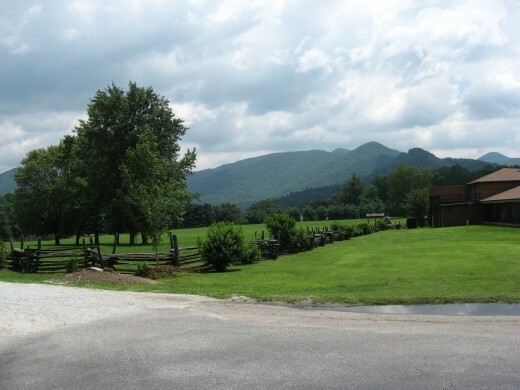 It’s surrounded by some of Georgia’s tallest Blueridge mountains, in a beautiful setting. It’s a great place to spend a few nights, and their restaurant is legendary! This is a gorgeous area, with green rolling hills, verdant valleys, small farms, mountain streams, and waterfalls. The area hasn’t been commercialized, so much of it remains pristine. If you’re in the vicinity, the Dillard House Restaurant is a definite must-do. 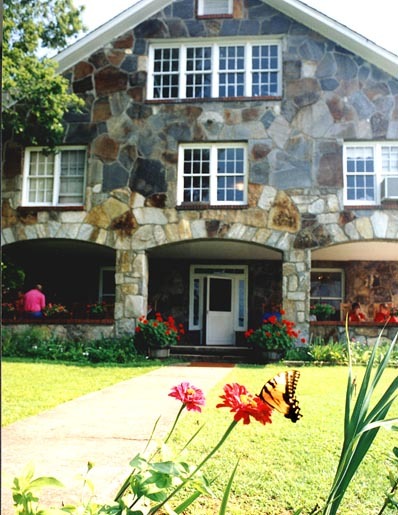 The building is made of local stone, with lots of large windows to take in the scenery of the Blueridge Mountains. The staff is super friendly, too, and there’s a great gift shop you can browse in case you have to wait for a table. The food here is amazing. Once you’ve been seated, you’ll be brought heaping platters of Southern delicacies, all prepared fresh and most locally grown and produced from the nearby farms. Dillard House is open for breakfast, lunch, and dinner. Breakfast is 7-10:30 a.m. and includes pancakes, bacon, sausage links and patties, scrambled eggs, fried potatoes, blueberry muffins, country ham, fruit pies, biscuits, cinnamon rolls, grits, pork tenderloin, stewed apples, fresh fruit, and juice. 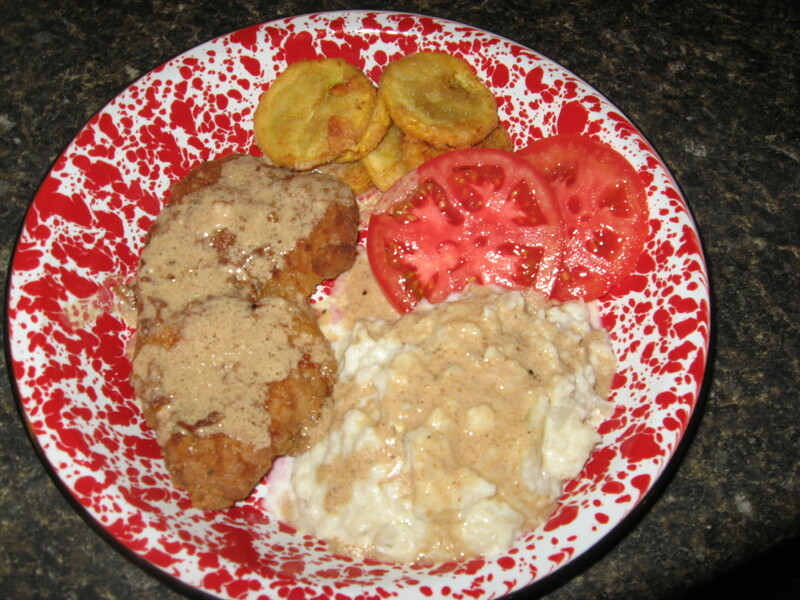 To pour over your grits and biscuits, there’s red-eye gravy and sausage gravy. Lunch is served from 11:30 to 5 each day, with sugar-cured ham, country fried steak, barbecued chicken, wonderful fried chicken (my personal favorite), fried okra, rice and gravy, corn on the cob, cabbage, green beans, potatoes, acorn squash, coleslaw, fresh melon, yeast rolls, and cornbread. For dessert, enjoy homemade cobbler with ice cream. Dinner at the Dillard House is served from 5 to 8:30 p.m. You’ll enjoy prime rib, country fried steak, fried chicken, barbecued chicken, country fried steak, ham, green beans, potatoes au gratin, Harvard beets, creamed corn, glazed carrots, broccoli, ford hooks, coleslaw, melon, sliced tomatoes, onions, rolls, and cornbread, with cobbler and ice cream for dessert. When we’ve eaten at the Dillard House, we were also brought homemade jellies, jams, fruit butters, and relishes. The menu changes slightly from day to day, but I guarantee that you’ll have a wide choice of delicious dishes! And as the platters and bowls are emptied, the staff keeps refilling them. After you’re done, your waitress will box up all the leftovers for you to take with you. 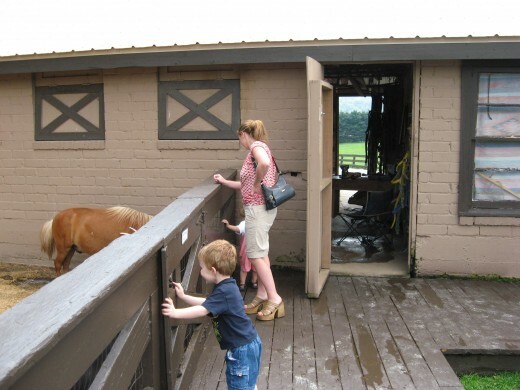 After the meal, mosey out to the barn to see the horses and to let the kids visit the petting zoo! Dillard House offers sever different lodging choices for guests – standard rooms, deluxe rooms, cottages, chalets, and cabins. The rooms start at just $59 a night, and some are complete with a front porch and rocking chairs. All provide glorious views. The cottages and mountain cabin rentals at Dillard House range from small and cozy to larger ones that are perfect for big families. One of the cottages has a Jacuzzi with great views of the surrounding mountains. Believe it or not, the cottages start at just $79 per night! If you want the ultimate mountain getaway experience, try one of the Dillard House mountain chalets in their chalet village. Ranging from small and intimate to large family-size chalets, these lodging options include decks complete with rocking chairs, full kitchens, cable TV, DVD players, and stone fireplaces with a supply of firewood. Guests at ChaletVillage also have access to a swimming pool, a hot tub, private tennis courts, hiking trail, and a trout pond. Summer rates for a chalet start at just $89 a night, with cheaper rates during the rest of the year. The chalets are perfect for honeymoons, families, and for couples looking for a romantic getaway. 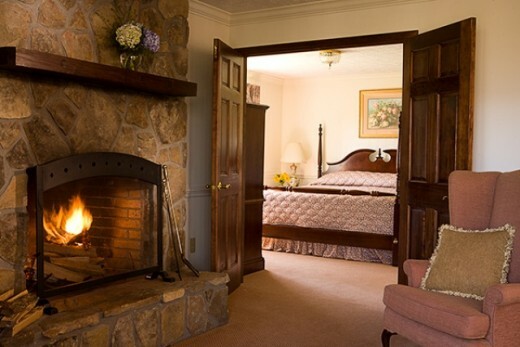 Dillard House also offers honeymoon packages, golf packages, spa packages, whitewater rafting packages, hiking packages, and horseback riding packages. As a horse lover, I’ve ridden at numerous stables while we were vacationing. At many of these establishments, the horses weren’t well cared for. You won’t find this at the Dillard House stables! All their animals are well fed, healthy, and well trained. They’re also beautiful! You’ll have several rides to choose from, including ones that take you through rivers, to scenic overlooks, and past waterfalls. There’s also a fly fishing ride that takes guests to remote streams and rivers that have experienced little pressure from anglers, so the trout there are often big and hungry! Rides range from 30 minutes to all day, beginner through advanced. Kids 3 and over can enjoy a ride in the ring. Dillard House has its own fly fishing school. Expert angler Rick Claridad teaches novice fishermen to properly cast a fly by the end of the first lesson. Guests can also go on a wild trout safari. These trips are either half-day or all day. On the full day trips, lunch and snacks are provided. 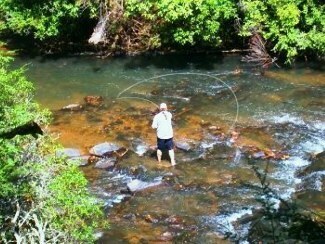 This is a chance for some awesome trout fishing! I’ve stayed at the Dillard House numerous times, and I’ve eaten at the restaurant many times. My kids, grandkids, and I have also ridden horses from the stables on several occasions, and I can vouch for all of these. We’ve never had any complaints about anything having to do with the Dillard House. I recommend all of the facilities to anyone planning to visit the area. 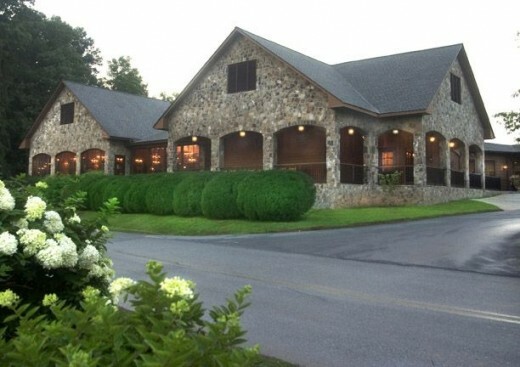 The resort is within driving distance of Helen, Cherokee, Tallulah Gorge, vineyards, gem mining, whitewater rafting, the Foxfire Museum, and numerous state parks, lakes, and waterfalls. 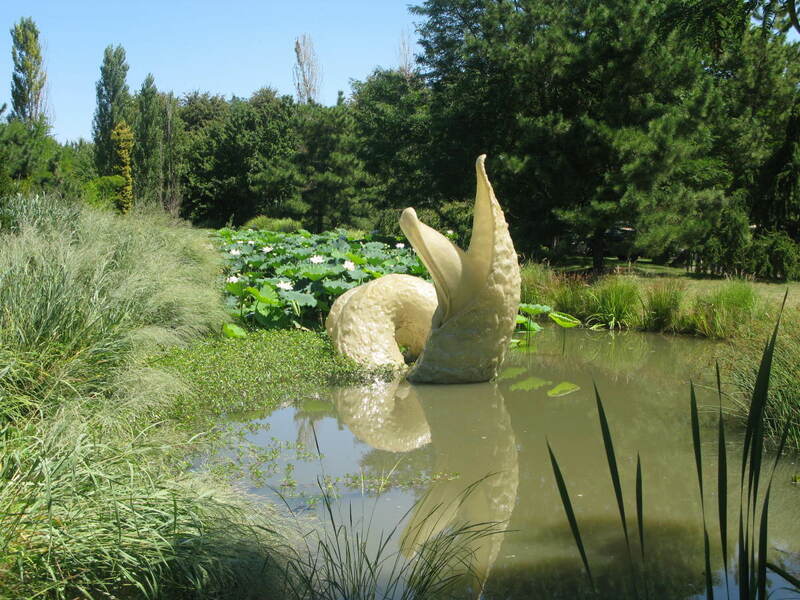 If you want to have even more fun on your mountain getaway, make the scenic drive to Cherokee to visit the attractions there. 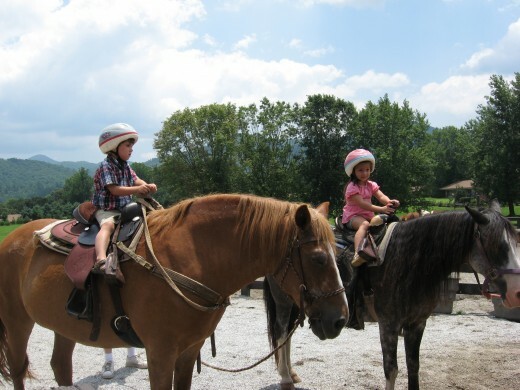 It's the gateway to the Smoky Mountains, and you'll find all kinds of stuff to do and see there for the entire family. Michael, I think you'll like it! Great review. I can't believe I've missed this place. Will put it on my list for places to stay! Thanks. Dillard House is a great place to visit, Peggy! So beautiful! I can't believe the prices of staying at the Dillard House. Sounds like a real bargain! 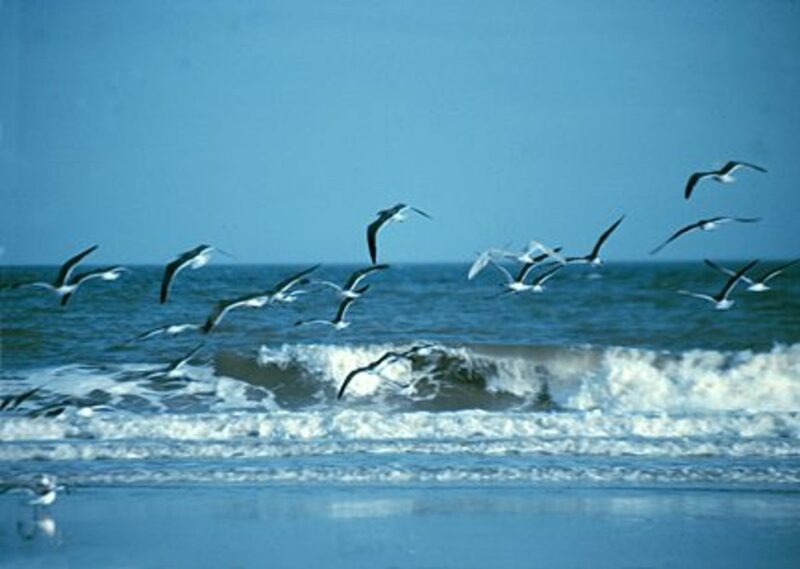 Loved the photos and your descriptions. Dillard House sounds like a great place to visit. Such a beautiful place and hub! Great job, loved the pictures! I want to go there soon. It's beautiful up there, Maita! You might not pass through Dillard, Michael. It's on US 441 in GA, just before you reach the NC line. Hi, Go To! I've done the river ride, which was really cool, but I've never done the overnight trip with them. One time my ex and I went there, and after talking with the stable girl, she discovered that we owned our own horses and were experienced riders. She took just the two of us on a great trail ride that was really challenging but awesome! Mark me down as another fan of Dillard House. We sometimes visit there for Thanksgiving. I've always wanted to take their overnight camping horseback ride or at least make it to the waterfall. Hi, Pam! Good - another fan of Dillard House! The Dillard House is well known throughout Ga and surrounding states. I am glad you did this hub. I love that area of the country and wish I could get up there more often. We lived in GA for 5 years and I miss being able to get to the mountains and to that wonderful restaurant. Good hub. Well, duh! No wonder this hasn't received any comments - I just realized there was no comment tab! I was surprised because the Dillard House is such a great place!